Oliver Toussaint Jackson was an example of 19th Century western African American entrepreneurship. Jackson created a restaurant, a farm and a laundry service. His most ambitious venture was the establishment of Dearfield, Colorado, an agricultural colony for African Americans about 70 miles northeast of Denver. Born in 1862 in Ohio, one year before President Abraham Lincoln issued the Emancipation Proclamation, Oliver Toussaint Jackson was one of six children of Hezekiah and Caroline Jackson. At 14, Jackson began working in the catering and restaurant business in Ohio. In 1887 when he was 25 years old Oliver and his wife Minerva moved to Denver, Colorado. 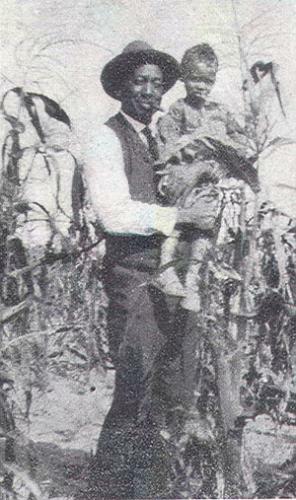 Disillusioned at the lack of economic progress and security of black Denverites after decades of residence in the city and inspired by Booker T. Washington’s 1901 autobiography, Up From Slavery, Oliver Jackson increasing came to believe that the destiny of Denver African Americans lay with a return to farming. In 1906, Oliver and Minerva laid plans for the establishment of an agricultural colony for African Americans on the High Plains. Unable to get much cooperation from the U.S. Land Office or much support from major African American organizations, the Jacksons after four years, found an area that they believed would support a colony of 200 families. Jackson also campaigned among prominent Colorado public figures for support and endorsement of his scheme. During the 1908 gubernatorial campaign, Jackson surprised many of his Republican friends by supporting Democratic candidate, John Franklin Shafroth who subsequently won the election. Jackson’s support earned him an appointment as a messenger for the Governor’s office. In 1910 Jackson persuaded Governor Shafroth to help him file a claim on the land that would become Dearfield, Colorado. For over a decade Dearfield attracted settlers from Denver, Minneapolis, Kansas City and other urban areas. At one time there were 70 families, well over 700 people living in the colony. Unfortunately, after World War I, the demand for their crops decreased, forcing many of the families to sell or abandon their farms. Oliver and Minerva Jackson stayed. Unable to find someone to take over the colony and unwilling to abandon the dream of a place where African Americans could generate their own wealth, they would spend the rest of their lives in Dearfield. Minerva Jackson passed away in 1942. Six years later on February 8, 1948, Oliver Toussaint Jackson died in Denver.